Middle school (or junior high as they called it in my town) is the worst. You're not a kid anymore, but not really a teenager yet, and you're just trying to figure out who you are and where you fit in the world while everything is changing at rapid speed. But that's what makes it such deliciously awkward fodder for a musical! 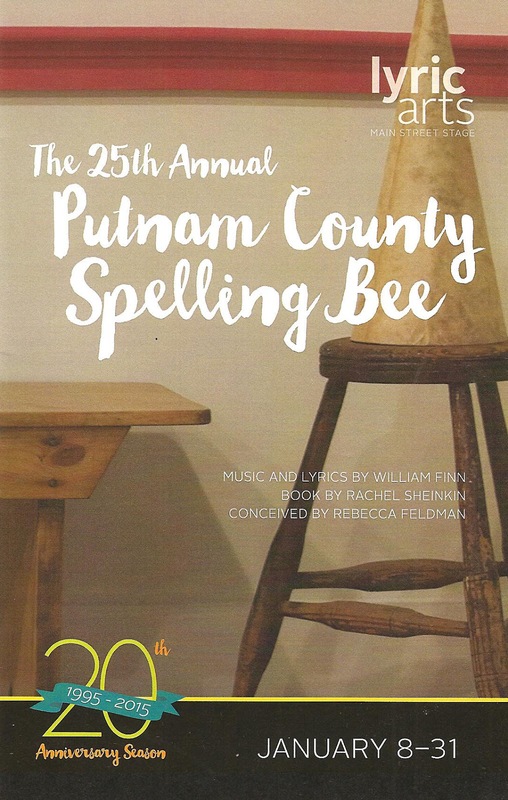 A 2005 Tony-winner for best book, The 25th Annual Putnam County Spelling Bee brilliantly illustrates the humor, trauma, elation, and devastation that comes with a middle school spelling bee. This quirky little musical is a great choice for Lyric Arts, and they've created a sweet and funny production with a solid cast. The musical takes place in real time during one spelling bee, with six kids who are over-the-top characters. Rounding out the contestants are a few recruits from the audience, which provides some fun opportunities for improv - you never know what will happen when you invite the audience up on stage! Former champion Rona Lisa Perretti (Lexi Harper) is hosting this year's bee with Vice Principal Panch (Rick Wyman), while tough but tender Mitch Maloney (Daniel Vinitsky) acts as "comfort counselor" to fulfill his community service requirement. The oddball kids include past champion Chip (Matt Berdahl), overachiever Marcy (Alison Rigazio), flighty Leaf (Kyle Szarzynski), neglected Olive (Anna Larranaga), pressured Logainne (Callie Schroer), and nasally challenged William Barfee (Tim Beeckman Davis). In between spelling words, we learn a little about each kid's life and family through flashbacks and fantasy sequences. One by one, Mitch escorts them off stage with a hug and a juice box when they hear the bell that indicates they've misspelled a word. Though very different, a love for words and a need to be loved and accepting bind the kids together. The funniest parts of the show are the contestant introductions and the sentences used to describe the words. 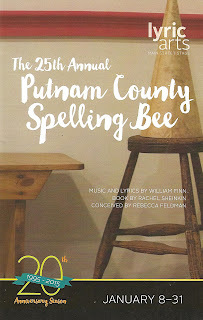 This is my 6th time attending the Bee (on Broadway, on tour, and a few local productions), and while some of the jokes are less funny when you know what's coming, the audience interaction allows for some room to play. Director Zach Curtis and team seem to have added in some new bits, or perhaps the script has some leeway in that area, so there were still plenty of new and surprising jokes that had me laughing out loud repeatedly. As Rona and VP Panch, Lexi and Rick keep the bee running smoothly, and the six actors playing the kids are all adorable and playful. However, it's noteworthy that the role of Marcy Park is not played by an Asian-American actress, as it traditionally is. Lyric Arts has been steadily improving over the last few years, and the next thing they need to work on to continue to the next level is increasing the diversity on stage (and in the audience). The cast is accompanied on these clever and catchy songs by a one-person band, Music Director Elise Beckel Santa, which seems perfectly appropriate for this small scale musical. Shannan Roberg's choreography keeps the kids moving around the stage and over the bleachers and desk, and even manages to incorporate the audience volunteers. Spelling Bee is a fun and charming show, not without moments of poignancy about that tough middle school age that will likely bring back memories both good and bad. In the director's note, Zach suggests "Embrace your inner misfit. And please enjoy the show." Watching these awkward, adorable, sweetly odd kids as they strive towards their goal and learn a few things about life, family, and friendship along the way is quite enjoyable (playing through January 31). Simply because the role of Marcy Park was played by an Asian-American on Broadway does not mean she needs to be played by an Asain-American in every production. In fact I think it's a shame that people assume she has to be Asain-American simply because of the stereotype that Asian-Americans are perfectionists and good at everything, as the character of Marcy Park is known for. There is nothing in the script that indicates Marcy is an Asain-American. I did this show in college and our Marcy was Caucasian. I believe diversity is always important, but I don't think "it's noteworthy that the role of Marcy Park is not played by an Asain-American"
I have not seen this production, but look forward to it this weekend. Thanks for the synopsis. Thanks for your response, anonymous. I definitely considered the fact that it's a stereotypical role, and is it racist for me to think that this overachieving student should be played by an Asian-American? But for me it comes down to the fact that very few roles in "mainstream" musical theater (or theater in general) are traditionally played (and even written for) Asian-Americans, so it somehow seems wrong to take one of these few away from them. If Lyric Arts had a better track record for diversity, I might not have minded too much. I'm sure that diverse casting is difficult in a community theater in the suburbs, but it's not impossible. Anoka is 88% white according to the 2010 census, which means it's 12% non-white, and I would love to see our increasingly diverse community represented on stage at Lyric Arts. As I said above, it's something for them to think about and work on as they continue their development as a Twin Cities theater. My apologies for spelling the word Asian incorrectly. I am an educated person.